A visit to a nature reserve is a great way to spend some time during 30 days wild, in fact it’s a great way to spend some time at any time of year. 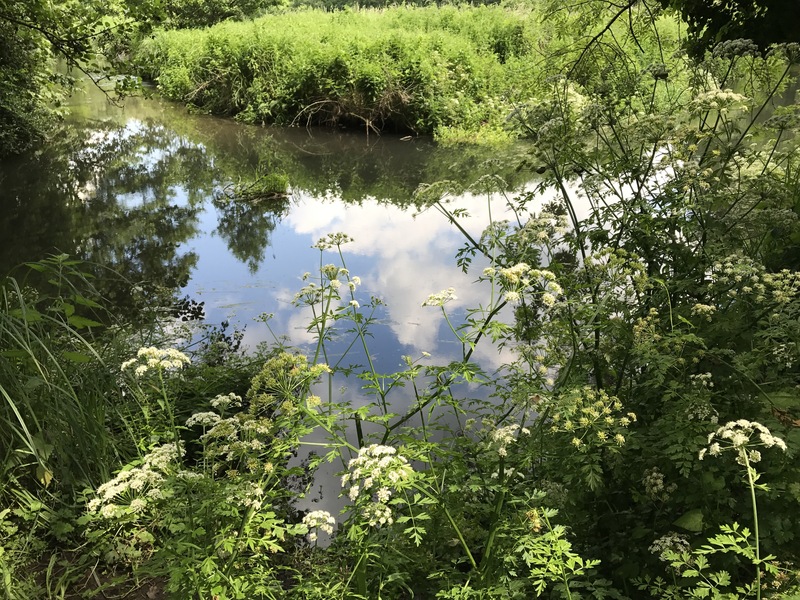 The Wildlife Trusts look after nature reserves all over the country, their Nature Finder App is a great way to find a nature reserve close to you. ​ The shade under the trees was delightful, welcome respite from the hot sun, earthy, cool and verdant. Next to the path the river burbled, sun sparkling on the water, weeds waving below, sinuous in the currents. Damselflies flitted above the water, iridescence gleaming, almost too fast to watch, splinters of gems poised for flight, vibrating on waterside vegetation. Unidentified damselfly- any ID help would be appreciated! 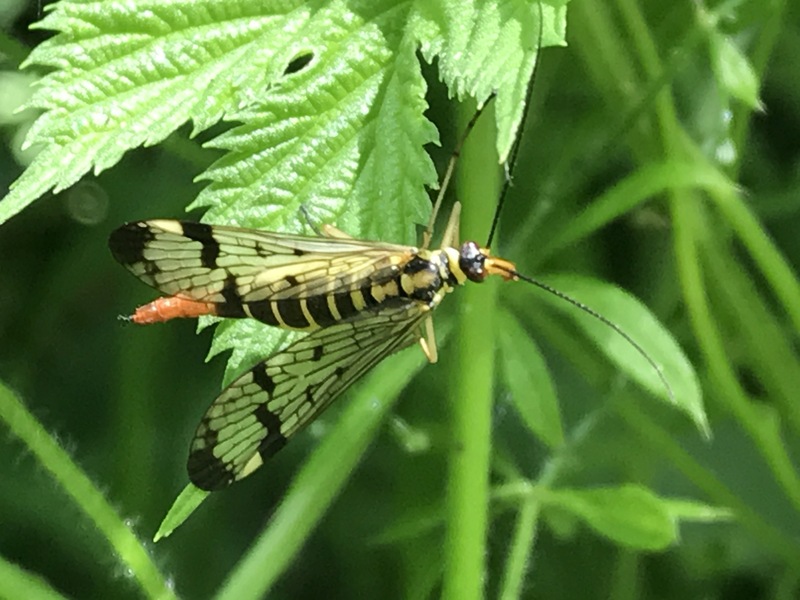 Hidden in the nettles, an insect I’d not seen before, chequered transparent wings, yellow and black striped body, a red tail, a scorpion fly! 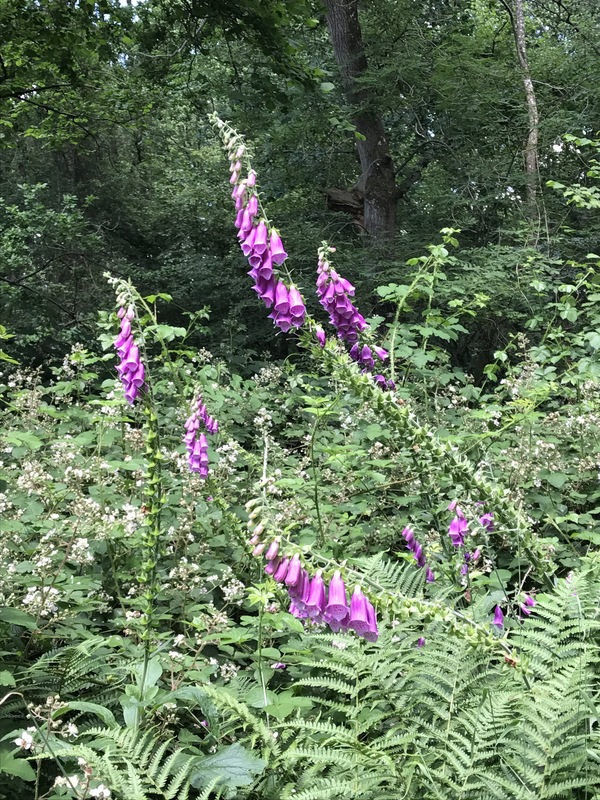 In the woods glades stands of foxgloves grew tall, pink flowers a splash of colour amongst the myriad shades of green. A chiff chaff called and all was still, quiet and peaceful. Leaving the wood the hot sun beat down, the meadow in front of us bright with colour and buzzing with life. The muted greens splashed with yellows, pinks, whites, an impressionist painting brought to life. Skippers flitted past, bees supped nectar from clover, the drone of crickets a constant undertone. Ahead of us on the path a small pale butterfly alighted- a common blue, beautifully detailed wings, a sight to make the heart sing. It was too hot too linger long, despite the beauty of the surroundings, so we were all too soon back into the cool embrace of the trees, long enough to cool down. An unfortunate speckled wood had met their end, prey to a small spider, guarding its prize. Further meadows awaited our gaze, heat shimmering above the grasses, beauty everywhere our gaze rested. I love this little insect I caught playing peek a boo. 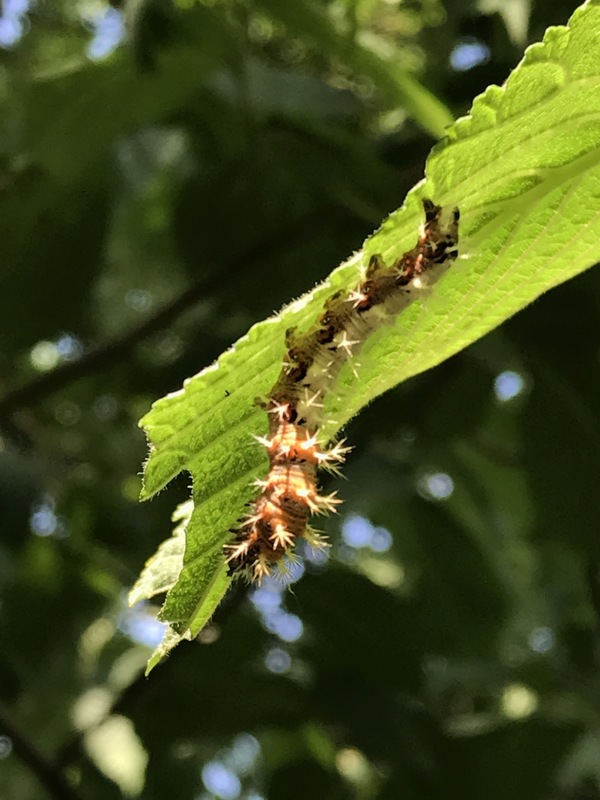 A last treat as we walked down the lane and out of the reserve, a final treat, a spiky caterpillar munching on a hazel leaf, helpfully identified on twitter as the caterpillar of a comma butterfly. We loved our sunny visit to Moor Copse, one of our favourite nature reserves. Do you have a reserve you like to visit? It was a fairly short visit, & Sunday not quite as hot as today, I’m melting! Thankfully it’s a bit cooler here today thanks to a nice breeze, but I was melting yesterday! Barely slept last night because of the humidity.